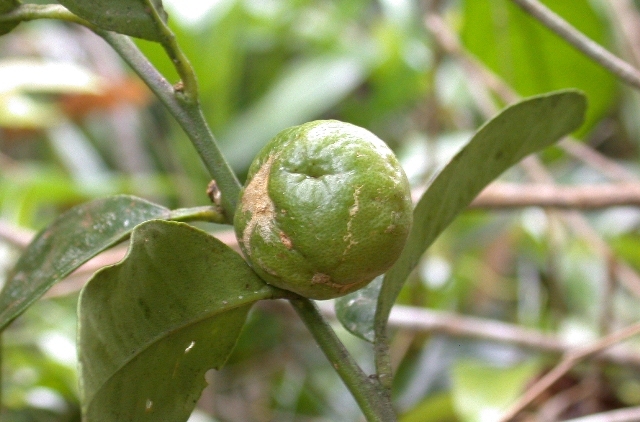 Mountain citron is a very little known fruit from South East Asia. It grows wild in Malaysian Peninsula, and adjacent peninsular region of Thailand and some isolated Indonesian islands. It bears sour fruits. 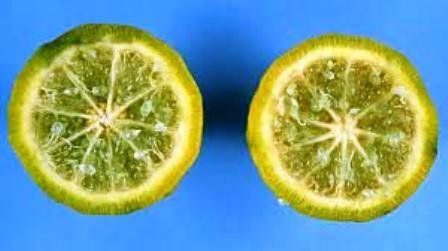 It is not in any way related to citron (Citrus medica). In Thailand it grows in the rain forests of the Southern regions between elevations of 900 to 1800 m.
In fact, this fruit has been identified by botanists not very long ago. It was described for the first time in 1973. A medium evergeen tree, upto 10 m high with sprout thorns. Leaves oval or elliptical, 8-15 cm long, . Flowers white, fragrant, 1-2 cm across. Fruits round, small 5-7 cm wide, edible, sour, rind thick, 6 mm, tightly bonded to flesh, orange at maturity, segments yellow green, flesh less juicy. Seeds large, upto 2 cm, many. Mountain citron fruits are sour. These are used as souring agents like lemons in salads and other culinary preparations in South East Asia. Mountain citron is collected from wild only. It is not cultivated. Many times people just protect a plant to have one in home gardens.